The oldest known Martian meteorite ? a space rock that fellto Earth ? is some 400 million years younger than originally thought. It formedabout 4.091 billion years ago, a time when the red planet was wet and had amagnetic field, a new study suggests. Studying this chunk of ancient Mars, which reflects thevolcanic processes and bombardment by space debris, could help scientistsbetter understand Mars'early evolution, as well as Earth's. The meteorite, dubbed ALH84001, was found during asnowmobile ride on Dec. 27, 1984 in the Far Western Icefield of Allan Hills inAntarctica. Many other Martianmeteorites have been found in Antarctica, as well as in remote regions ofAfrica, but ALH84001 is the "oldest by billions of years," said TomLapen of the University of Houston, who conducted the new study of themeteorite. It's about 2.5 billion years older than other Mars meteorites, whichget kicked up from the surface of Mars by space rock impacts, flung into space,and then eventually hit Earth. Previously, ALH84001 had been given an age of about 4.51billion years, which would make it part of the primordial crust of Mars ? thefirst rock to solidify from the planet's cooling magma ocean. But "therewas some question about the generally accepted age," Lapen told SPACE.com. Lapen and his colleagues used a relatively new technique toevaluate the age of the meteorite, one which has been applied to other Martianmeteorites. This method looked at the variations in the isotopes of twominerals, lutetium and hafnium, which formed as the rock crystallized frommagma. The team's analysis, detailed in the April 16 issue of thejournal Science, shows that the age of the meteorite is actually 4.091 billionyears old, about 400 million years younger than the earlier estimate. The new age rules out the rock being a fragment of Mars'primordial crust. Instead, it likely formed from more recent volcanic activityin very active regions such as the Tharsis and Elysium volcanic regions, whichare home to the largest volcanoes in the solar system. The age also supports thelong-lived volcanic activity of these regions. "We uncovered evidence that the volcanic system in Marswere likely active more than 4 billion years ago," Lapen said. "Thisconnection allows the possibility that regions with the largest volcanoes inthe solar system perhaps host some of the longest-lived volcanic systems in thesolar system." The meteorite also shows signs of being shocked by impactsto the Martian surface. Estimates of the periods of bombardment of Mars made byexamining the chronology of craters on the planet's surface suggest that aperiod of heavy bombardment occurred just before this rock formed, or perhapswhile it was still forming. The age of the rock also puts it at a time when liquid waterwas present on parts of the Martian surface. Mars also had a magnetic field atthe time that the rock was formed. The presence of water and a magnetic field,which can shield the surface of a planet, are both conditions favorable to theformation of basic life forms, though whether or not Mars ever hosted life isstill an unanswered question. ALH84001 has been at the center of the Martian life debatebefore, as some argue itholds fossilized bacteria, though that claim is highly contentious. 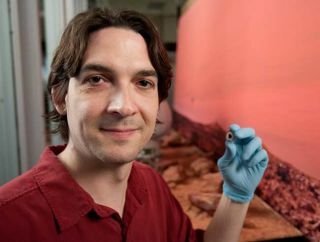 Having a piece of Mars' early crust is helpful to scientistswho want to better understand the conditions on the planet early in its history.While most Mars meteorites are much younger, with few older rocks, "Ithink we'll eventually find more," Lapen said.